It’s safe to say I’m obsessed with sushi, to the point where I’m convinced I could eat it everyday and never get tired of it – although I’d probably go bankrupt in the process. Sheffield has a couple of Japanese restaurants, but Sakushi is the one I eat at the most. 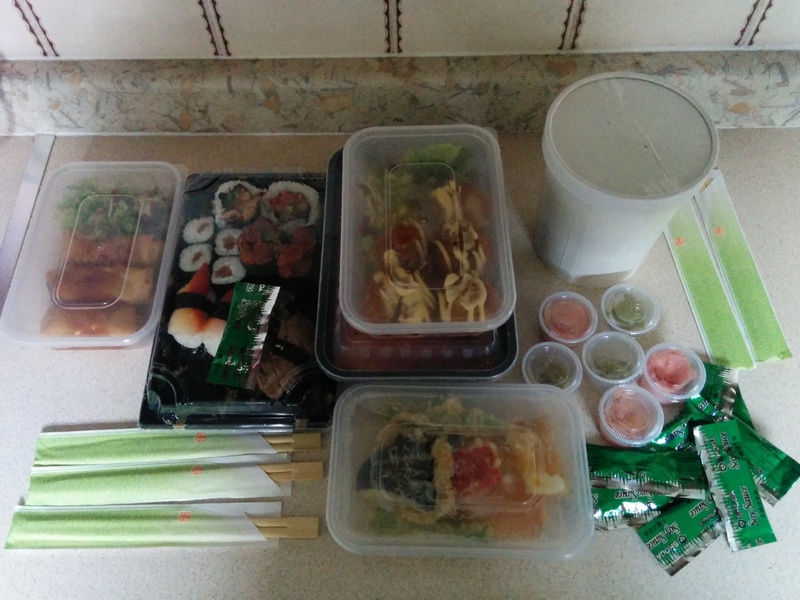 I’ve already written about the dining-in experience at Sakushi’s Campo Lane restaurant, and I reviewed a truly epic Sakushi takeaway I had last year, courtesy of hungryhouse. But, whenever I order anything from Sakushi, it’s always so good that it seems a shame not to write about it. 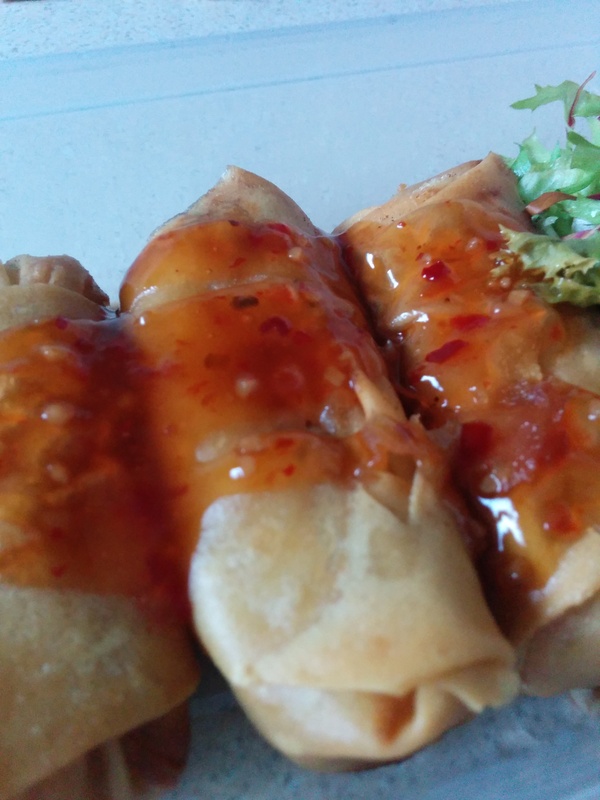 And, since my latest takeaway featured a few items I haven’t tried before, I thought a second review of Sakushi’s takeaway was in order. I’ve ordered more Sakushi takeaways than I care to count, and the quality has always been every bit as good as the food they serve in their restaurant. Sakushi also put lots of added extras into their takeaway bags, including tonnes of pickled ginger, packets of soy sauce and chopsticks, which is a nice touch. The delivery is always prompt, even when I’ve ordered at peak times like Friday and Saturday nights. 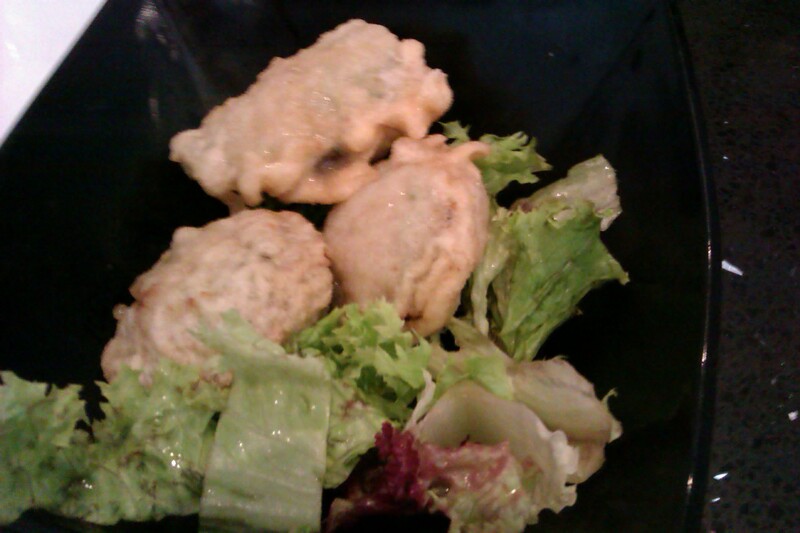 My only complaint about Sakushi’s takeaway, is that occasionally they’ve got an item in my order wrong. This has happened on a couple of occasions (including this order – but more on that later!) and the strange thing is that I always place my takeaway orders online, so it’s not even like they could have misheard me down the phone! On this particular night, me and a sushi-loving friend decided to order a few things to share. Sakushi’s delivery, as always, was speedy and the takeaway came with lots of added extras, including chopsticks that I can’t use – but it’s the thought that counts, right? We kicked off our Japanese feast with a few different kinds of sushi that you can order separately from Sakushi’s menu. Our sushi ‘starter’ consisted of spicy tuna gunkan (2 pieces for £3.50) mixed nigiri (3 pieces, £4.00) and steak nigiri (2 pieces for £3.50), plus some surprise shitaki nigiri that neither of us had ordered (normally £2.50 for 2 pieces, according to the menu). 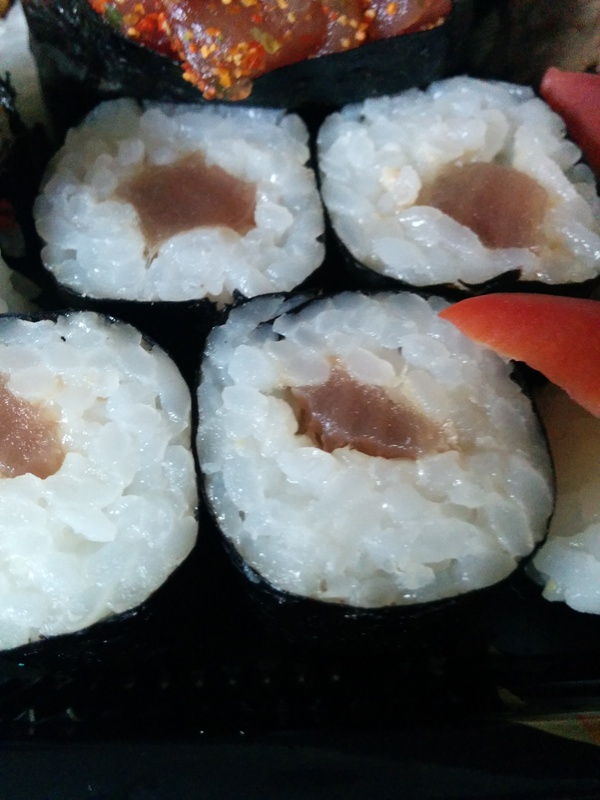 After checking my email confirmation, it became clear that Sakushi had sent us this mushroom nigiri instead of the squid nigiri we’d ordered. This was annoying, as I’m not a big fan of vegetable-based sushi. To me, the best thing about sushi is the fish and the seafood, so although I do like mushrooms, this shitaki nigiri was never going to go down well. The shitaki nigiri had a really strong, earthy flavour that I did enjoy, and the mushroom itself didn’t have that wet, slippery texture that cooked mushrooms sometimes have – but I’m still not sold on vegetable sushi. This just isn’t something I’d ever choose to order. 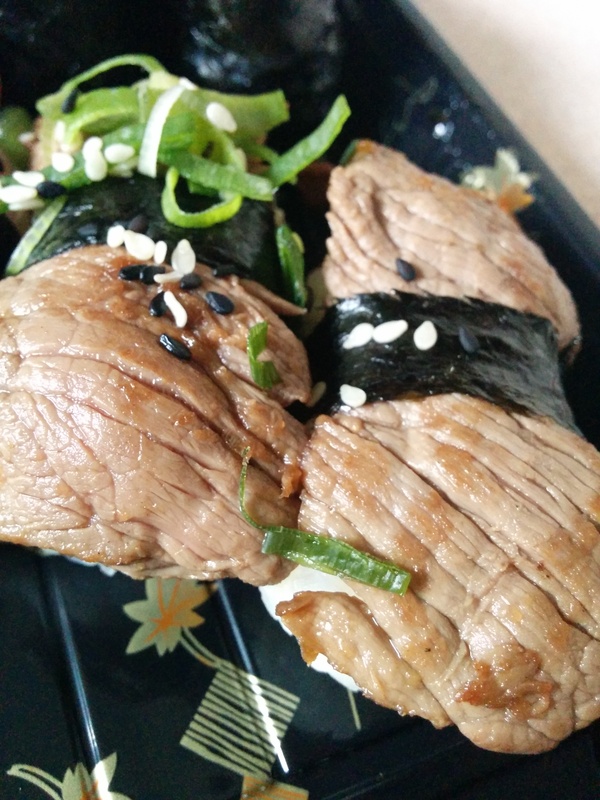 The steak nigiri got a big thumbs up from my friend. The pieces of steak were generous, tender and juicy – basically everything you want from a steak! The meat had also been seasoned well, and sprinkled with fresh spring onions that worked really well with the richness of the steak. 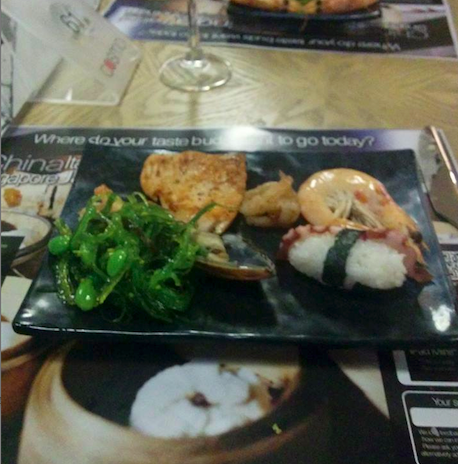 The mixed nigiri gives you the chance to taste three different kinds of nigiri: salmon, prawn and tuna. It’s perfect if you’re feeling indecisive, or if you enjoy trying a few different things. Of the three, the tuna and salmon were my favourites. Not only were the pieces of fish far bigger and thicker than the prawn nigiri, but they’re also raw, so they have that really strong, distinctive sashimi taste that I love. Next to the raw salmon and tuna, the cooked prawn nigiri just seemed a bit bland and boring. Still, I love the tuna and salmon nigiri, and I’m a big fan of getting to try a few different things – so for £4.00 I’d definitely order this again. 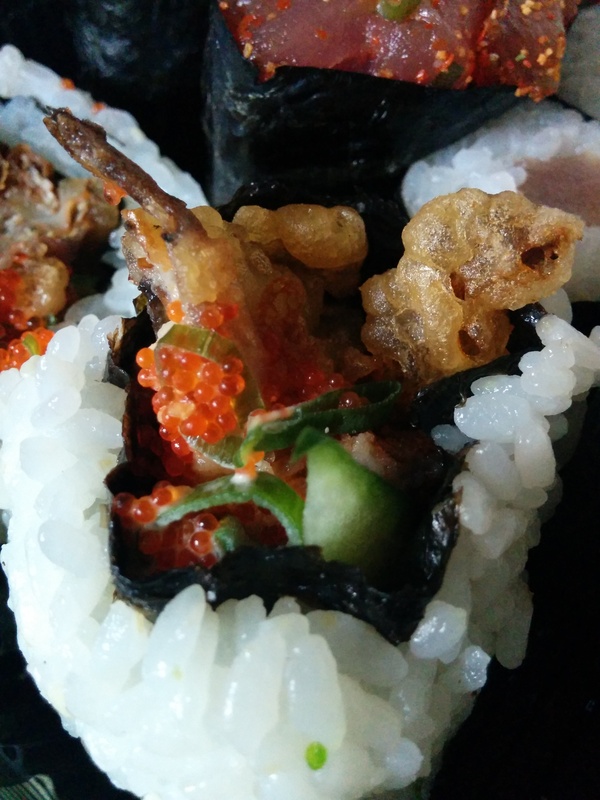 But, by far the best thing about our sushi ‘starter,’ was the spicy tuna gunkan. This gunkan is a seaweed roll packed with lots of diced raw tuna, and covered in a delicious and unique combination of spices. 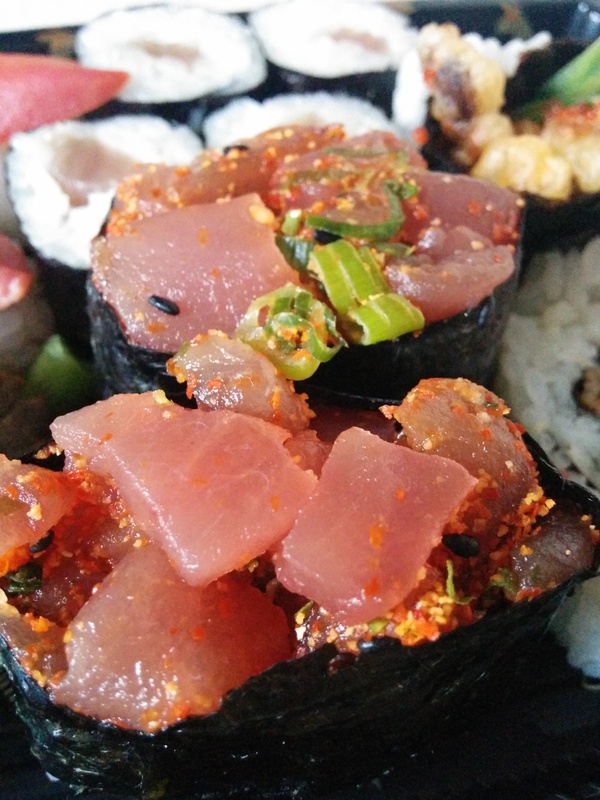 This is the kind of spice that catches in the back of your throat and makes you cough, but if you can take the heat then it makes for some seriously tasty sushi, and the spices work perfectly with the earthiness of the raw tuna. I’ve had Sakushi’s spicy tuna gunkan a few times before and have always enjoyed it, so I’d decided to finally branch out and try the other kind of spicy gunkan on Sakushi’s menu – salmon gunkan. Our second plate of sharing sushi was made up of the spicy sake gunkan (2 pieces, £3.50) that I couldn’t wait to try, plus another helping of spicy tuna gunkan (yep, I’m obsessed with this stuff) and crab gunkan with mayo (2 pieces, £3.50). 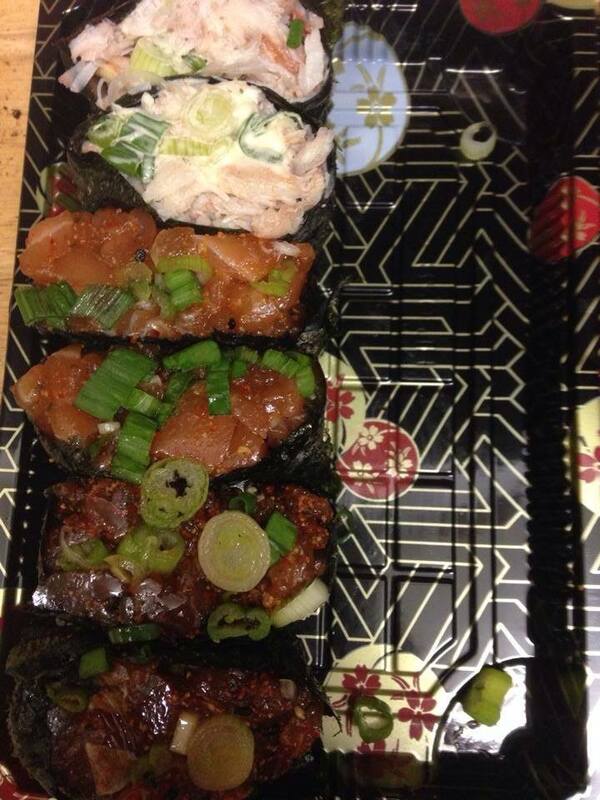 The spicy salmon gunkan seemed to have exactly the same mixture of spices as the tuna gunkan. Whatever combination of spices Sakushi use, it’s really hot but also full of flavour. I’m hooked – I just want more of this stuff. The diced salmon had a much lighter taste than the tuna gunkan. I can’t make up my mind which I prefer. Looks like I’ll just have to order both from now on! The third and final gunkan was completely different. Sakushi’s crab gunkan has a nice amount of fresh crab meat, but it also has way too much mayo, to the point where it completely overwhelmed the crab. 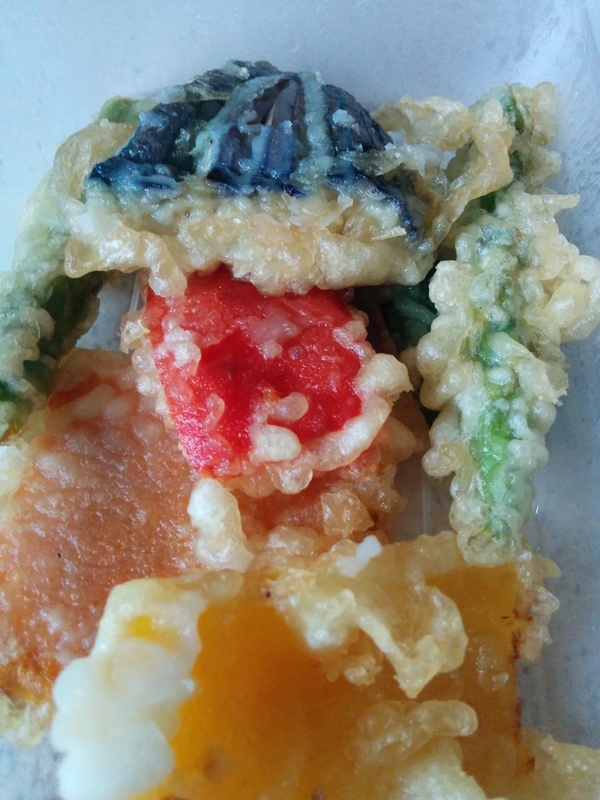 Sorry Sakushi, but this is one gunkan I won’t be ordering again! 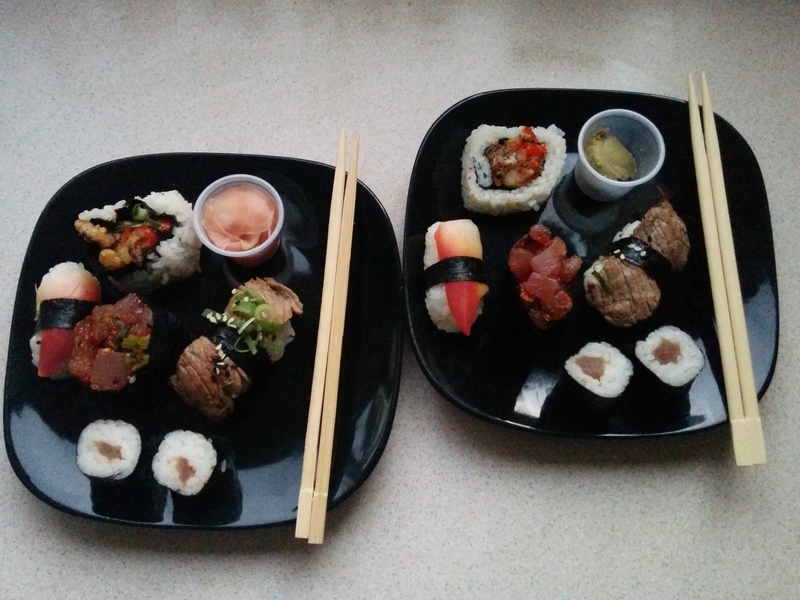 Sushi dispatched, it was time for our mains. Since me and my friend are both obsessed with sashimi, we’d ordered two sashimi-based main courses to share. First up, was a thing of beauty: a Fuji Sashimi platter. This is a whopping 21-piece platter of tuna, salmon, sea bass, ika (squid), tako (boiled octopus), hokkigai (surf clam) and fish roe (£23.85). 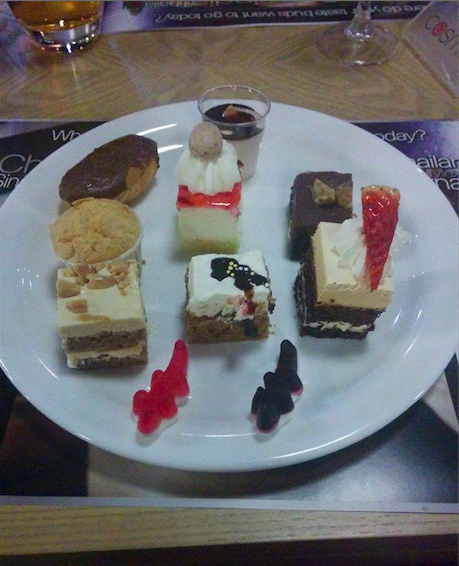 Everything on this platter is pretty special, but my personal favourites were the tuna and salmon. This isn’t just because I’m obsessed with the taste of raw salmon and tuna, but also because Sakushi are seriously generous when it comes to how much salmon and tuna they give you. Just look at those wedges! These are some seriously thick, juicy cuts of sashimi. I could have eaten 21 pieces of nothing but salmon and tuna sashimi and been perfectly happy. The cuts of squid, surf clam and sea bass are on the thinner side, but they’re also really light and refreshing, which is a nice contrast to the stronger tastes of the tuna and salmon. My only gripe with this platter is that, next to so much delicious sashimi, the boiled octopus was a bit bland and boring – not unlike the cooked prawn in my mixed nigiri. 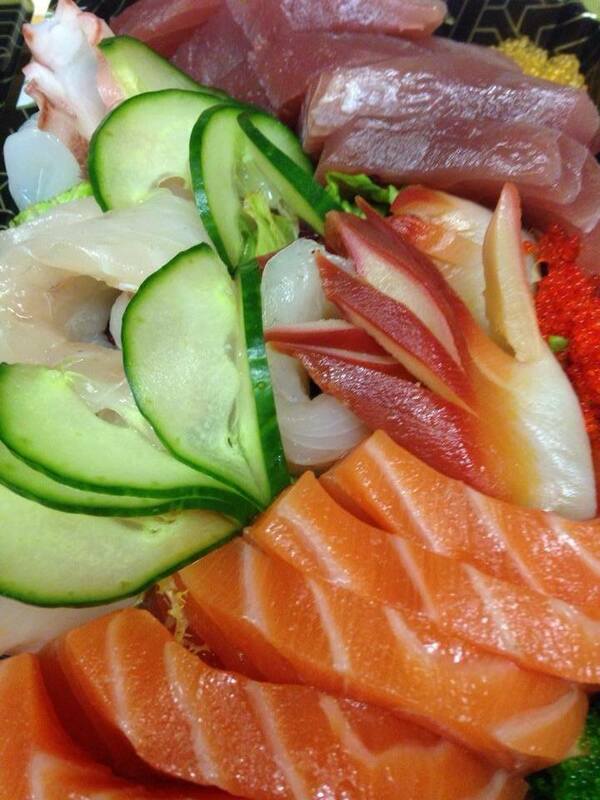 If you love sashimi, then Sakushi’s Fuji platter is food heaven. It’s big enough to share, or it makes a truly indulgent treat for one. If 21 pieces of sashimi sounds a bit insane, then it’s worth noting that Sakushi do offer a smaller version of this platter, which includes all the same fish and seafood, but in smaller quantities and without any fish roe (£16.95 for 15 pieces). 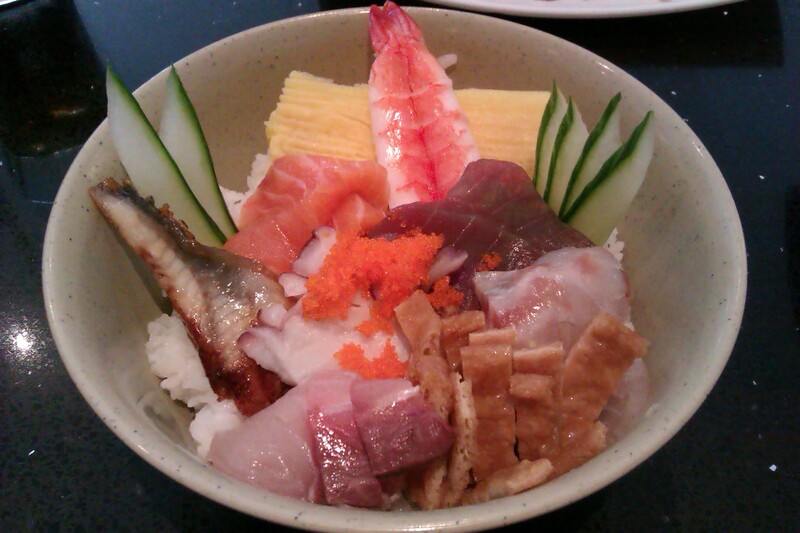 For our second main course, I’d ordered one of my all time favourite things from Sakushi: a Chirashi-Don (£13.45). Sakushi’s Chirashi-Don is a super-sized portion of sticky sushi rice topped with salmon, tuna and squid sashimi, plus lots of colourful fish roe. The roe gives the Chirashi-Don a really intense, salty flavour and is particularly good mixed into the rice. 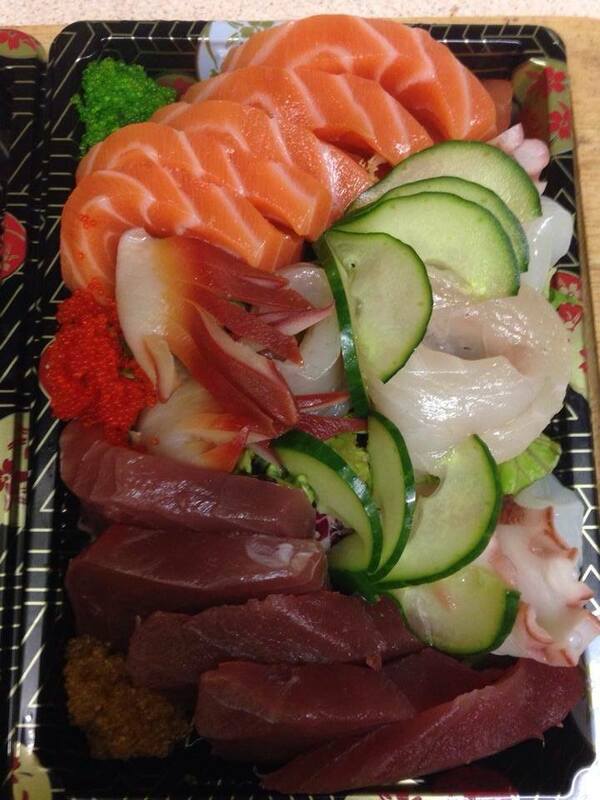 You also get a good variety of sashimi, although the cuts are a bit on the thin side. Sashimi on its own is delicious, but it’s not always particularly filling. This is why I love Sakushi’s Chirashi-Don so much – you get to sample some seriously tasty cuts of sashimi, but you also get to stuff your face with a super-sized portion of rice that’s guaranteed to fill you up. I also have a major soft spot for Sakushi’s rice, as it’s always lovely and sticky without being soggy, and it has a subtly vinegary flavour that I’m addicted to. Basically, Sakushi’s Chirashi-Don is pretty much my perfect meal. 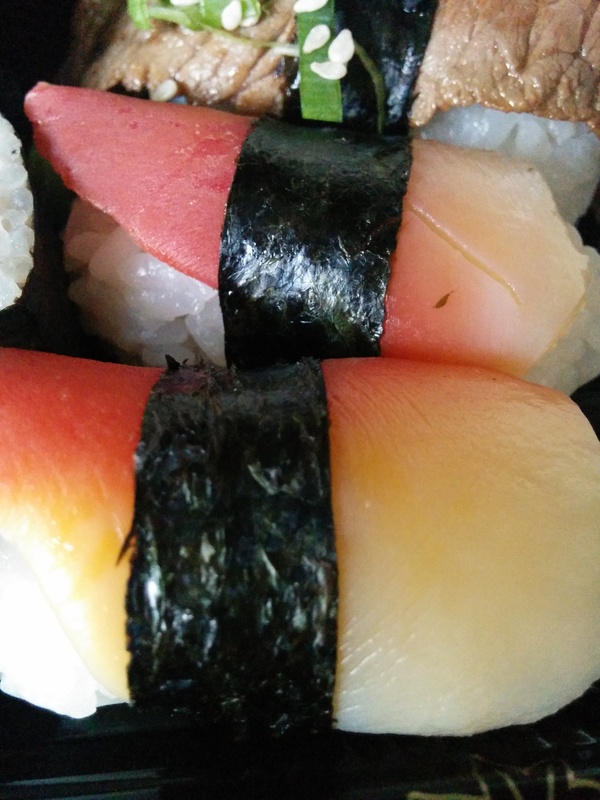 While Sakushi’s Campo Lane restaurant is really nice and modern, and has a really fun conveyor belt of sushi, sometimes there’s nothing better than delicious food delivered direct to your door. I’ve always found Sakushi’s takeaway to be every bit as good as the food they serve in their restaurant, and this takeaway was no exception. Apart from the crab gunkan and mushroom nigiri, everything was delicious and I wouldn’t hesitate to order it again. 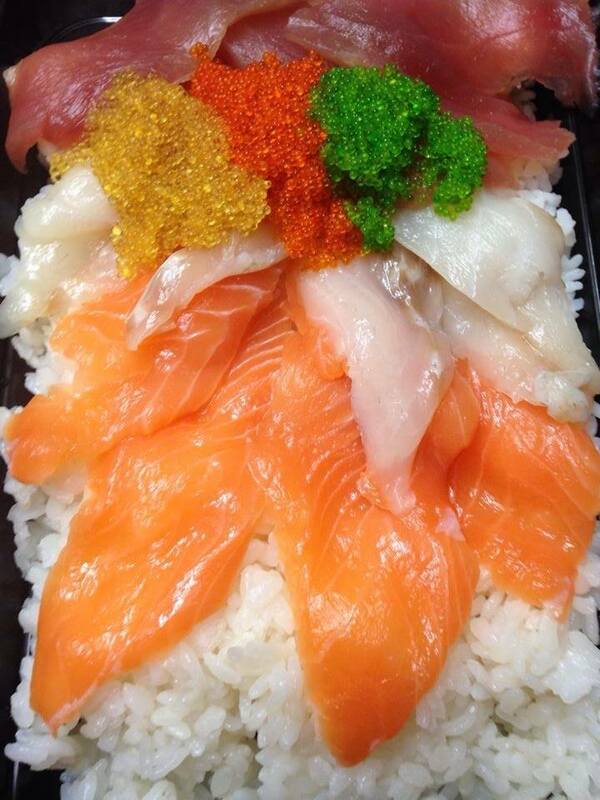 If you like sashimi, then you need to try the Fuji platter and Chirashi-Don. And, if you have a soft spot for spicy foods, then both the spicy salmon and spicy tuna gunkan should be right up your street. In fact, the only truly disappointing thing was that Sakushi got one item of my order wrong. If I hadn’t ended up with that mushroom nigiri, this would have been the perfect takeaway. 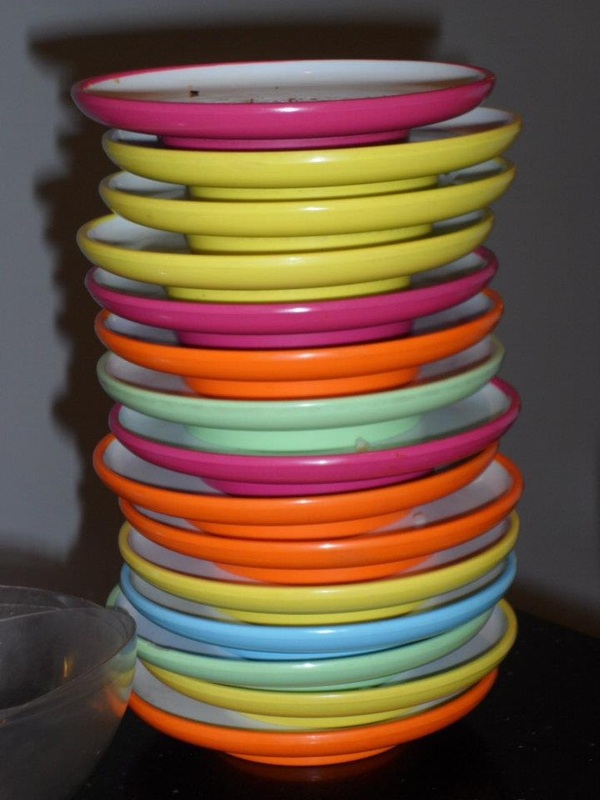 A few people had mentioned Cosmo to me since it opened in St. Paul’s Place a couple of weeks ago. If you’re not familiar with Cosmo, it’s a new “all you can eat” place where you get to cram your face with cuisine from around the world: Japan, China, India, Italy, Mexico, Korea, and more. 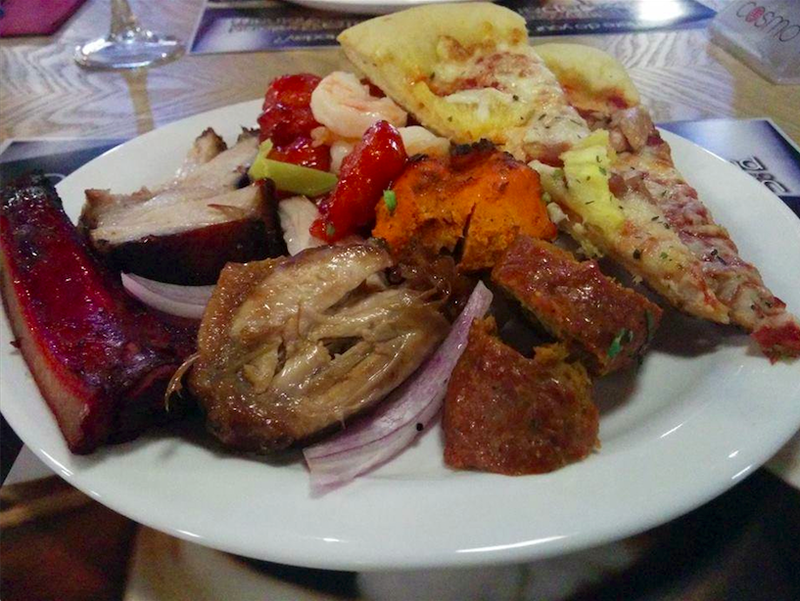 My experience of “all you can eat” buffets has previously been restricted to Chinese fodder, so I was intrigued by the variety that Cosmo offers. “All you can eat” may not be fine dining, but everyone enjoys being greedy once in a while, so I decided to give Cosmo’s “World Banquet Dining” a whirl. How much you’ll pay for the pleasure of filling your face at Cosmo, depends on whether you visit on a weekend or a weekday, and whether you partake of their lunch, or their evening buffet. Lunchtimes and weekdays are cheaper, while evenings and weekends are more expensive. You can expect to pay anything from £7.99, to the top price of £14.99 (the Cosmo website has more information on pricing). I visited on a weekday evening, so paid £13.99. The first thing you notice about Cosmo, is the sheer size of the place. Cosmo is easily one of the biggest restaurants I’ve ever visited. Somewhere that promotes itself as “World Banquet Dining” obviously needs a large buffet area, but Cosmo takes this a step further with separate buffet areas for each type of cuisine they serve – the buffet alone is the size of a regular restaurant! The dining area itself is equally super-sized, to the point where it’s more like a Meadowhall-style food court than a restaurant. Before I could take a seat and commence feasting, our party was told that we needed to give a name to the front of house staff, and then wait to be shown to our table. Despite there being rows upon rows of empty tables just a few feet away, we had to wait almost 10 minutes before it was our turn to be shown to a table, and during that time more people kept arriving behind us. I can imagine Cosmo’s waiting area becoming unpleasantly crowded, and the wait become longer and longer during peak times. My advice? Get there as soon as the lunchtime or evening service starts. Finally seated, it was time to set off on our culinary trip around the world. First stop; the Japanese and seafood section. I wasn’t expecting much from Cosmo’s fishy selection (good seafood tends to be pricey, after all), but I was pleasantly surprised. Cosmo had a decent selection of sushi, platters of mussels and king prawns on ice, a cucumber and smoked salmon salad that didn’t skimp on the salmon, and some other fishy bits and bobs. When you can eat as much as you want, there’s going to be compromises when it comes to the quality of the food. All you can eat sushi can’t compare to a sushi restaurant, where you may end up paying more for a single plate of sashimi, than you do for the entire Cosmo experience. Cosmo’s take on everyone’s favourite seafood-and-rice delicacy, involves going heavy on the rice, light on the fish and seafood, and opting for cheaper fillings such as cucumber sticks and processed meats. The king prawns and mussels were plentiful, but on the chewy side, and the edamame beans weren’t seasoned, so they tasted like boring, boiled green beans. So far, Cosmo was exactly what I’d been expecting; decent enough grub to heap onto your plate, but nothing I’d be happy to be served in a restaurant. However, Cosmo does have a trick up its sleeve for seafood lovers, in the form of a live cooking station, where you can get delicious morsels of seafood cooked to order. If you’re willing to wait a few minutes, you can choose from squid, king prawns, scallops, or salmon, freshly sizzled on a “Teppanyaki” hotplate. You can only order two items at a time, and the portion sizes are small, but that doesn’t matter when you’re being served slivers of perfectly-cooked, perfectly-seasoned seafood. 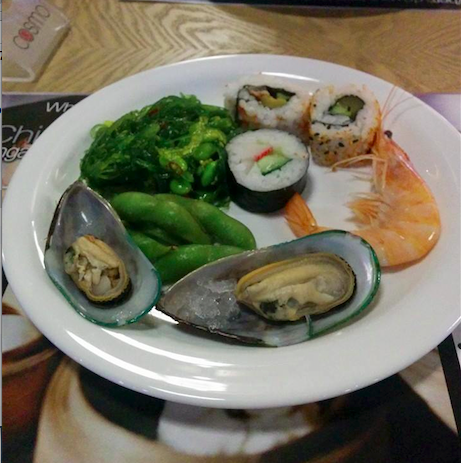 It’s touches like the Teppanyaki bar, that sets Cosmo apart from the “all you can eat” crowd. 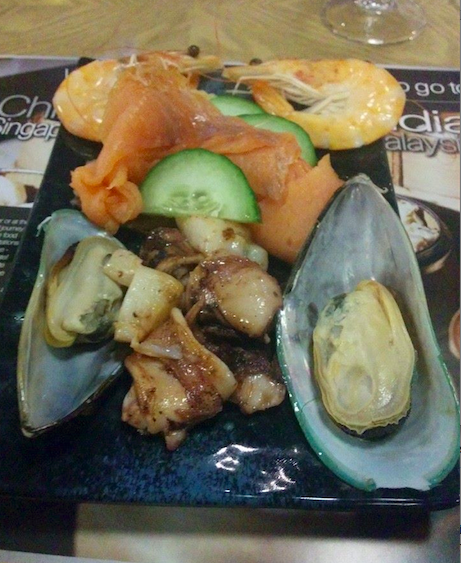 A mix of buffet seafood, with some freshly-cooked squid from the Teppanyaki bar. Even if the idea of buffet sushi fills you with horror, one thing that’s worth grabbing from the Japanese section is the salad of shredded green beans in sesame oil. It’s a strong, slimy salad, but once you get over the initial strangeness, it’s deliciously different. After the seafood, it was time to sample some Chinese and Indian grub. If you’ve ever been to a Chinese buffet before, you know the drill: fried rice, prawn toast, spring rolls, stir fried vegetables, noodles, and meat in sticky sauce. When it comes to Indian, Cosmo have a selection of curries, as well as everyone’s favourite Indian side dishes: poppadoms, dips, and bombay potatoes. 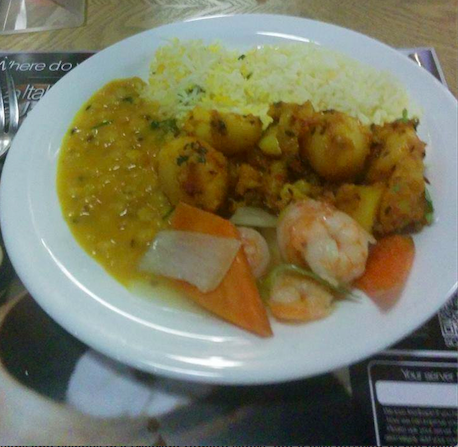 It’s all standard buffet grub, although Cosmo go easy on the seasonings and spices for both cuisines, so if you regularly eat at Chinese and Indian restaurants, you’re going to find Cosmo’s offerings a bit on the bland side. Another plate, another country, and this time it was a trip to the Mexican taco stand. 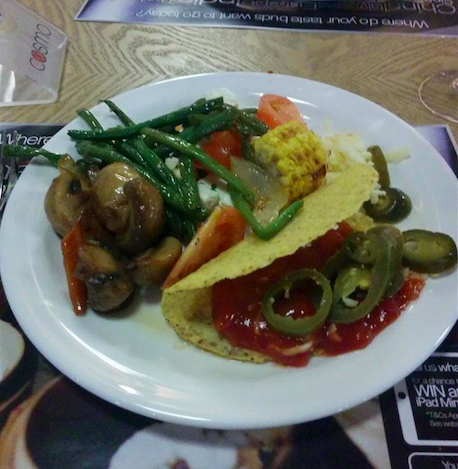 The taco shells were surprisingly crisp and crunchy, to say they’d been sat under a heat lamp, and there was a good variety of sauces and toppings on offer, so I piled my plate high with cheese, zingy salsa, and sharp, pickled jalapenos. The way Cosmo label their dishes, is my other major gripe. On the evening I visited, the Chinese meals were meticulously labelled, right down to the garlic and other herbs used in each dish, but elsewhere the labelling was hit-and-miss. If you have a long list of foods you don’t like, or any food allergies or intolerances, buffets are always going to be a minefield – but Cosmo should at least give you the gist of what each dish is! When it comes to meat, if you’re a committed carnivore, then Cosmo will leave you spoilt for choice. The meat lovers in our group gave the quality of the meat a big thumbs up, piling their plates high with meaty pizzas, barbecue ribs, sausages, and Chinese-style beef. I still had a list of foodstuffs I wanted to try, but I was starting to struggle, so it seemed time to wrap things up with a spot of dessert. 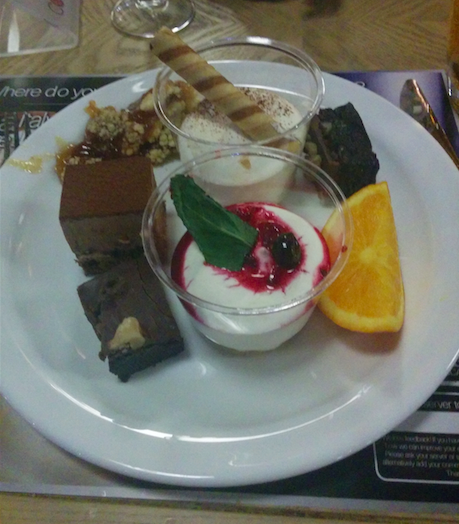 With all the savoury fodder on offer, I wouldn’t have been surprised if Cosmo treated pudding as an after thought. They don’t. The Cosmo buffet has an entire section dedicated to sweet treats, including hot desserts, cold desserts, cakes, bowls of sweets, and fruit – not to mention a chocolate fountain, with all sorts of goodies for dipping. It’s enough to give you one roller coaster of a sugar-rush! The best part of pudding, is the bite-sized cubes of cake. Whether it’s a mouthful of tiramisu, a square of double-chocolate brownie, cheesecake, carrot cake, or sponge, it’s the perfect portion of something sweet to finish off the meal. And the best bit is they’re so small, you can try a bit of everything! My advice is to ignore the larger “pudding cup” style desserts, as they’re mostly cream, with just a tiny bit of cake buried in the bottom. And who wants to fill up on spoonfuls of cream when Cosmo has so much more on offer? It’s easy to pick fault with individual items on the Cosmo buffet, but you can’t really compare “all you can eat” grub to dishes that are cooked to order in a restaurant. I went to Cosmo expecting a simple case of quantity over quality – but this wasn’t completely the case. In terms of quality, Cosmo is a cut above what you’d expect from an “all you can eat” establishment, and the variety and quantity of food is second to none. I even discovered a few dishes that I’d have been happy to be served in a restaurant, which was unexpected! Cosmo serves up massive amounts of grub, the occasional star dish, and generally delivers great value for money. Most of the time, eating out is about the quality of the ingredients, and how much care has been put into preparing your meal – but sometimes, you just want to stuff your face until you can’t move. When you’re in the mood for the latter, Cosmo is perfect. 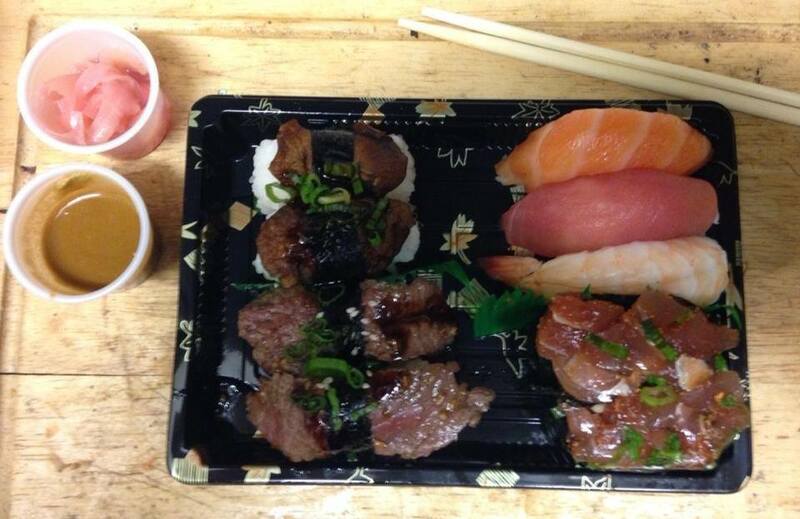 There’s no denying it: sushi is THE lunchtime treat for when you’re having a tough day at the office. If you’re keeping an eye on the pennies, then the value-for-money Edo Sushi takeaway is the perfect place to grab a box of fishy goodness on the go. But, if you’re hankering after an hour away from the office, then Sakushi is worth a visit for those with a few notes in their back pocket. Located conveniently on Campo Lane (slap bang across the road from The Wig and Pen, incidentally) Sakushi puts a trendy gloss on the traditional Japanese restaurant. The interior is all sleek, spotless monochrome, white leather booths and super-efficient staff. Sakushi even modernizes the old cliche of the sushi conveyor belt, with pods of sushi sweeping around a stylish steel ornament and past a reassuringly open kitchen. 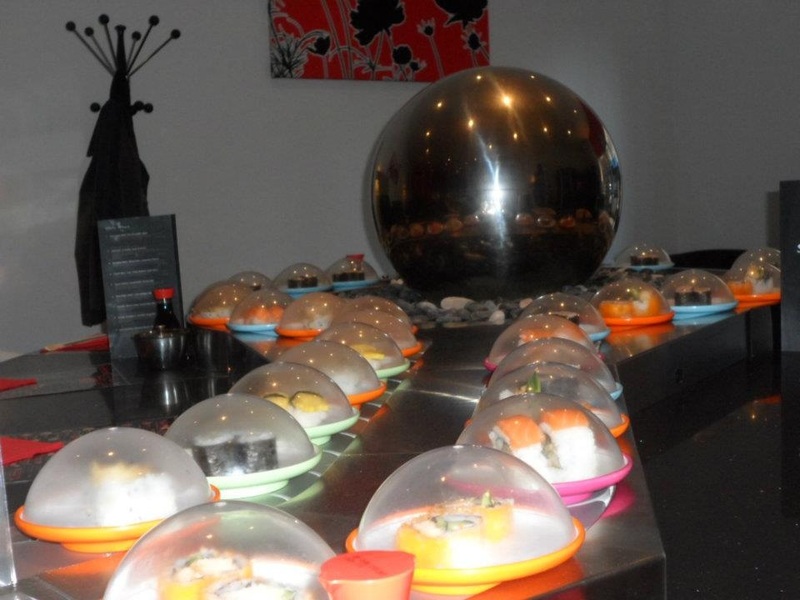 Even though you can grab your meal straight off a conveyor belt, there’s nothing tacky about Sakushi. The menu is so exhaustive that newcomers to Japanese cuisine are advised to study it online in advance. Not only does Sakushi offer a wide choice of sushi and sashimi, but there’s an equally impressive range of cooked mains and Japanese tapas too. Our party decided to put every section of the menu to the test – sushi, tapas and cooked mains – to bring you the most comprehensive review possible. We’re selfless, like that. We began our epic feast with sushi. At Sakushi, you have a choice: you can either reach across and yank whatever takes your fancy off the conveyor belt (the colour-coded plates are then stacked up on your table and the staff tot up the total at the end of the meal) or you can order plates of sushi from the menu. Since we’re an impatient lot, we got stuck in with the conveyor belt. The sushi portion of our feast consisted of a couple of plates of the Mixed Nigiri (£3.80) which featured all our favourites: salmon, prawn and tuna sashimi. Also cherry-picked from the conveyor belt were Tuna Nigiri (£3.30) and Sake Nigiri (£2.30) both of which boasted a generous slab of raw fish, and the Hamachi Nigiri (£3.30.) Made with “yellow tail” the Hamachi Nigiri was a new one on us, but the tanginess of the pale fish won us over – a newfound favourite! The Tako Nigiri (£2.80) divided opinion; the chewy, raw octopus wasn’t to everyone’s palate – personally, I found the taste a little overpowering. The big hits at our table were the Sakushi Roll (£3.80) which was laced with crunchy tempura batter, the creamy Salmon and Avocado Roll (£2.80), the Spicy Tuna Roll (£3.30) and the Fresh Crab Roll (£3.80) which was jam-packed with shredded crab. Sushi fanatics, beware: it’s easy to lose track of what you’re spending, especially when you’re sat next to a revolving door of delicious-looking sushi. It’s a good idea to set a limit on how many plates you’re going to have in advance. Needless to say, we didn’t set a strict limit and got carried away….. But, we’d solemnly sworn to sample the cooked mains and Japanese tapas as well as the sushi. So, loosening our belts we ordered a portion of the Shiitake No Kani (£4.95), shiitake mushrooms and crab in breadcrumbs served with a sprinkling of side salad. 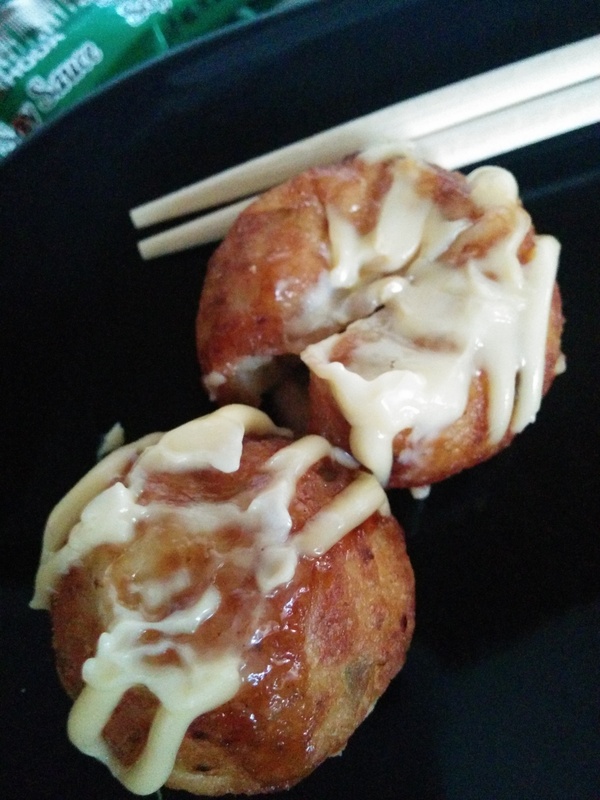 Generously filled with shredded crab, these little balls of goodness had our reviewer raving. Who would have thought shiitake mushrooms and crab meat would be a match made in heaven? Rich and creamy, and highly recommended. 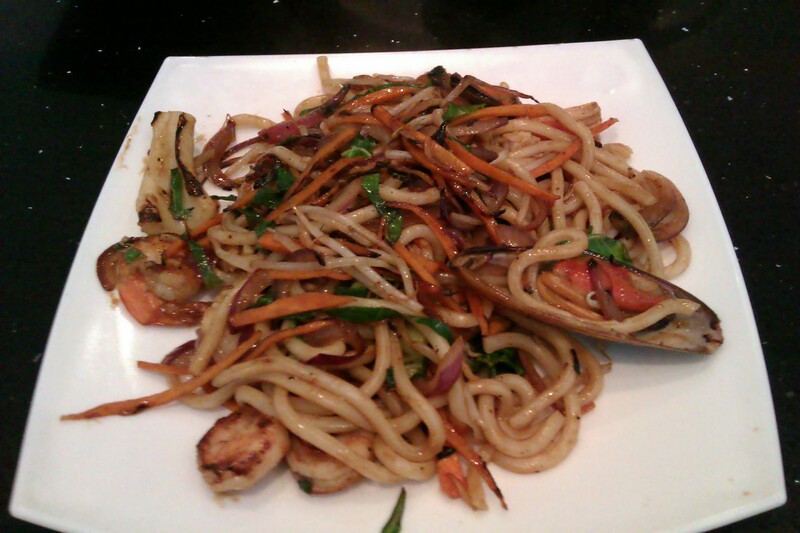 Also arriving at our groaning table, was a big plate of Seafood Yaki (£9.65.) This belly-buster can be ordered with a choice of sauces – traditional Yaki sauce or sweet Teriyaki sauce – and either soba or udon noodles. 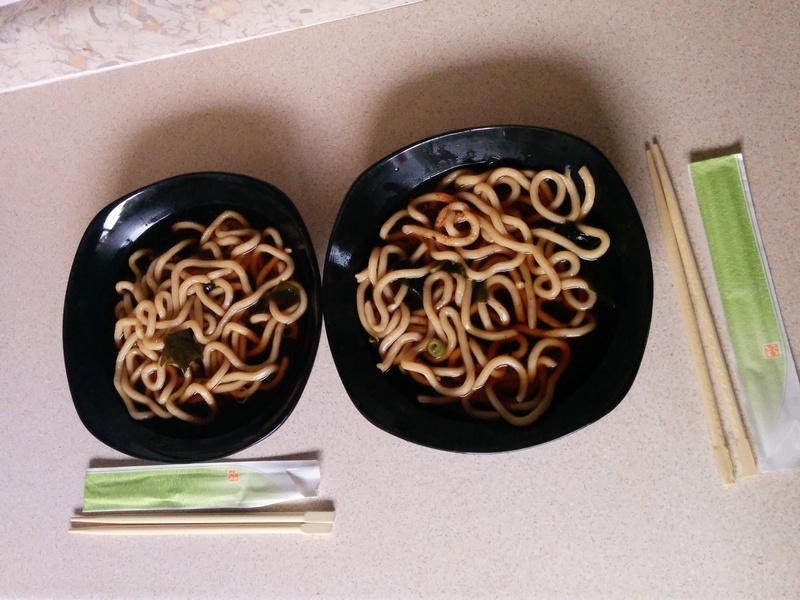 Our reviewer settled on traditional sauce and udon noodles. In addition to noodles and sauce, the dish contains tiger prawns, crab sticks, calamari, butter fish, mussels and seasonal greens. The tangy sauce went down well, but we were disappointed by the amount of seafood and felt the £9.65 price tag was a little on the high side for what was essentially a posh stir fry. Not content with the upteen plates of sushi and sashimi I’d already done away with, I ordered the Chirashi – Don (£11.14) from the main menu; slices of mixed sashimi on a large helping of sushi rice. When it arrived, my mouth dropped open – it looked absolutely amazing. The sushi rice was sticky and morish, but the sashimi was the real star of the show. The bowl included generous chunks of my favourite sashimi, tuna and salmon, and new-favourite yellow fish, alongside love-it-or-hate-it slices of octopus, a curl of meaty eel and a prawn. 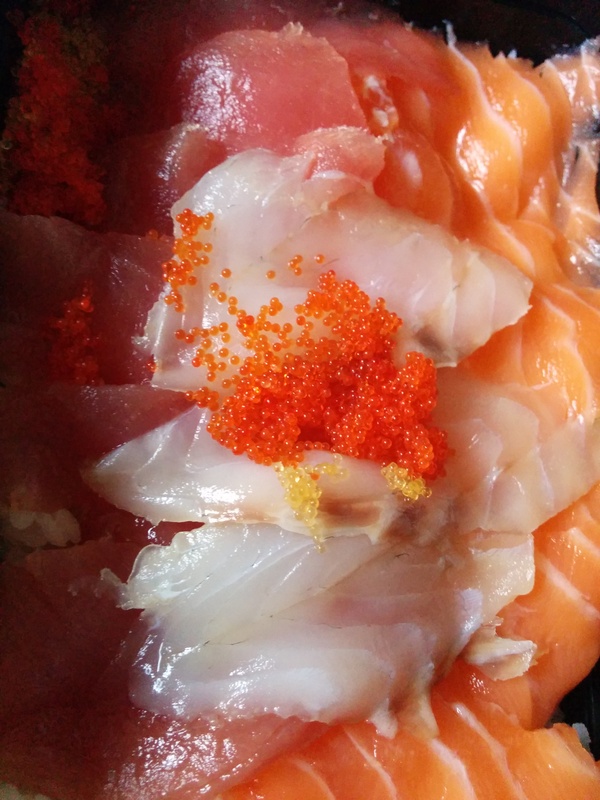 All of the sashimi tasted just-pulled-out-of-the-sea fresh, and the dollop of fish roe gave the dish extra bite (although as a massive roe fan I’d have liked an extra few scoops!) The strips of fried tofu skin perfectly complimented the dish, delivering a welcome hit of sweetness whenever the saltiness of the sashimi became overpowering. 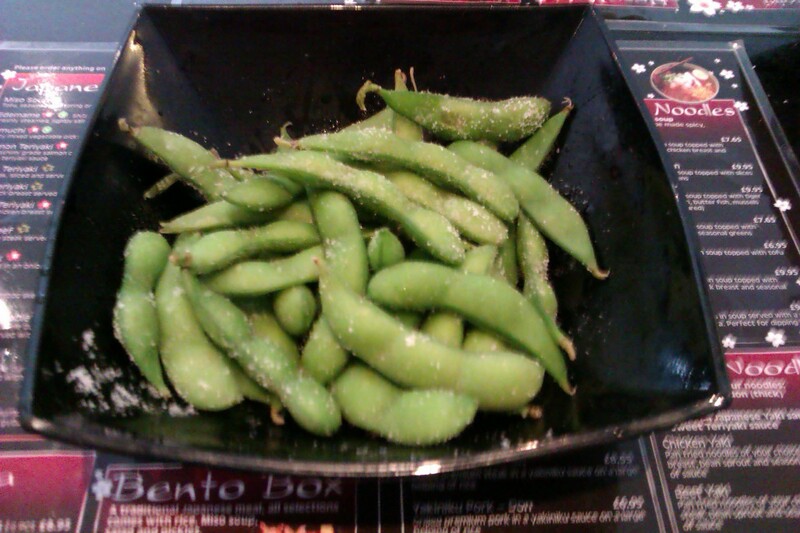 For a side order, I plumped for a portion of edamame beans (£2.55), which were served lightly steamed and juicy. The drinks menu was on the pricey side, so we ordered cokes that came in at £2 a pop. For a small glass bottle of the fizzy stuff (not even a full pint!) we still felt this was cheeky – although going out for sushi and sashimi is rarely a cheap experience! 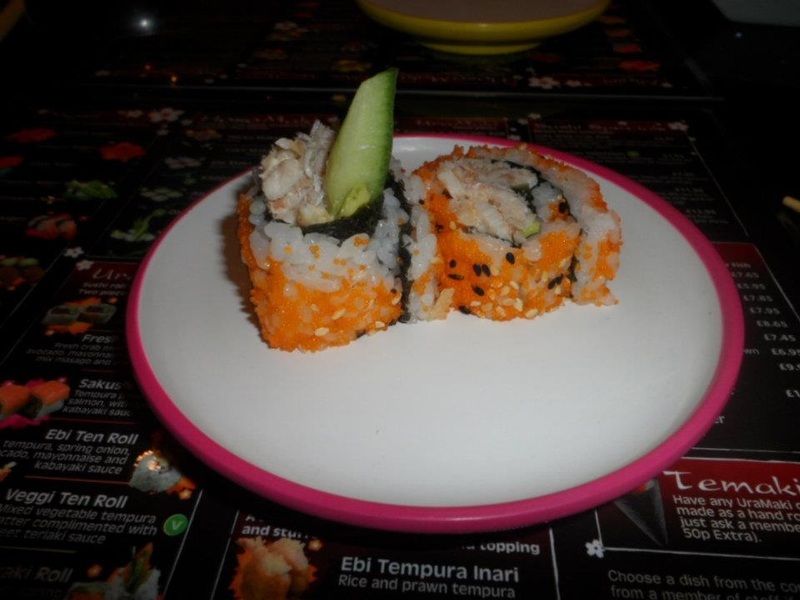 If you’ve got the time to venture out of town, then Yama Sushi is a cheaper alternative and, if it’s just sushi you’re after, then Yama can’t be beaten for the freshness and sheer tastiness of their sushi. However, if it’s a quick, city centre lunchtime treat you’re after, then Sakushi is the place to go – just keep a mental running total of the bill, because Sakushi can quickly turn into a bank-busting lunchbreak.